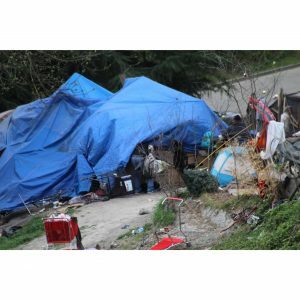 Fresh off his victory lap exposing the disastrous reality of public drug injection sites in Vancouver that led to the demise of a similar opium den proposal for Denver, Peter Boyles headed to Seattle to see how public camping for the homeless was working out for them. Check out the KNUS photo gallery here. Peter Boyles told the newspaper he plans to discuss his findings, repeatedly, on his talk show, and welcomes questions from callers who support Initiative 300 to overturn Denver’s camping ban and give the homeless privacy rights on public sidewalks, parks and streets. Once again, Boyles has done what the rest of Colorado media are just too lazy or biased to do — their jobs as journalists. Despite their ever-present tone of righteous indignation, we highly recommend the Westword story — the parts about what Boyles and his team witnessed during their trip, anyway. It’s like looking through a crystal ball at Denver’s future, if voters pass that ballot measure next month. « BOMB CYCLONE: Will Garcia Keep the State Capitol Open During a Blizzard Again?